There’s a problem with most of the poultry feed on the market today; it lacks adequate nutrition to provide flocks with a well-rounded diet. In fact, certain poultry feed ingredients can actually block the ability of many birds to properly absorb nutrients. Raw soybeans, for example, can inhibit pancreatic trypsin activity and protein digestion in chickens. The result is reduced feed intake and lower feed efficiency. It’s important to consider these factors in order to provide a balanced diet that supports normal body functions. Regardless of the poultry species in your operation, the nutritional requirements are similar across the board. We all know the six basic components of poultry nutrition: water, carbohydrates, fats, proteins, minerals, and vitamins. A diet that combines these elements in the proper proportions will sustain poultry’s normal breathing, eating, digestion, growth, reproduction, and egg production. Amino acids are divided into essential and nonessential. Essential amino acids are not produced in sufficient quantities by poultry, so they must be supplemented to create a well-rounded diet. Nonessential amino acids are generated by the body in adequate supply when basic feed requirements are met. Vitamins are organic compounds poultry need in small quantities to support normal body functions, healthy reproduction, and optimal growth rates. Vitamin deficiencies often lead to disease or syndromes. Minerals are required for a variety of roles in poultry health. These include the formation of bones and red blood cells, correct muscle function, blood clotting, energy metabolism, and enzyme activation. These dietary nutrients provide a source of energy and protein that helps to sustain birds’ wellness and increase profitable production levels. 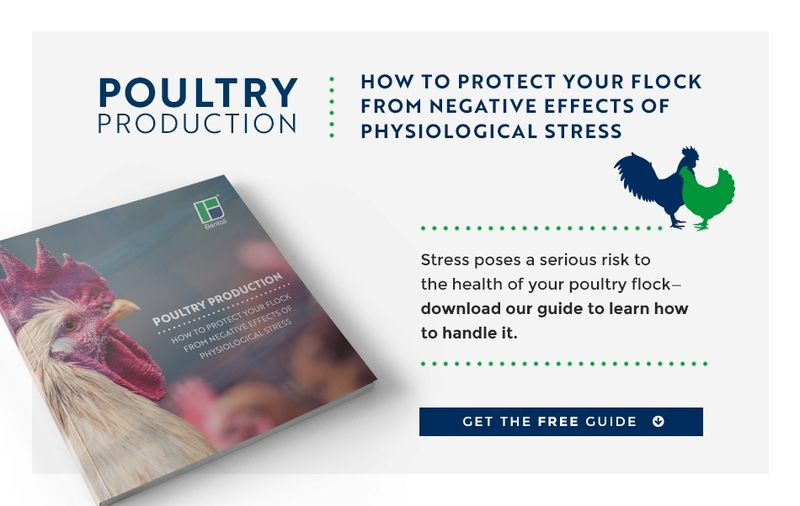 Many factors influence the degrees of nutrition required in poultry diets. Factors like the reproductive state of birds, their overall health, housing systems, and production goals each entail unique dietary modifications. For example, birds with high production demands—such as daily egg laying—will need a diet rich in protein. On the other hand, a flock experiencing emaciation and weakness needs to be checked for vitamin deficiencies and determine which additives will reverse the negative effects. One thing that often hinders the effectiveness of a well-rounded poultry diet is the physical form of feed. For example, processing nutritious feed with low-quality pellet binders will lower the efficiency of that feed. An abnormally high number of fines will be produced, forcing poultry to expend more energy consuming fines. Hence the lowered efficiency. A series of trials conducted by Bentoli’s feed experts found that the Pelex® pellet binder significantly improved the quality of poultry feed for Cobb broiler chickens. Pelex® was added before the pelleting process and was tested side-by-side in a feed without Pelex®. If your operation wants to increase feed efficiency, reduce the production of fines, or increase feed pellet durability, you should consider the benefits of using a high-quality pellet binder. Not only can the best pellet binders improve growth rates and boost poultry health, they can also provide higher economic returns.